Recreating the software for the HP 250 is a little more complicated than for other computers. 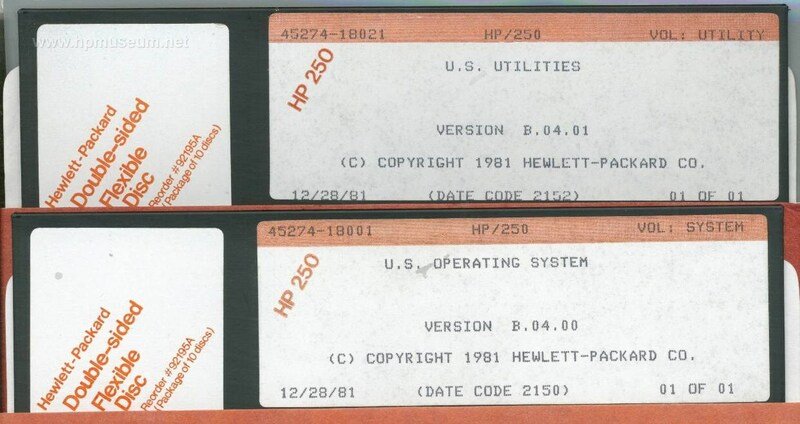 The original discs were archived from 8 inch floppies to 3.5 inch HD floppies using an HP 260 and a 9122C. Unfortunately, the 250 will not interface to either 9121 or 9122 3.5" flexible disc drives. To recreate the archived software, you will need your handy HP 260, 9122C (to handle 3.5 inch HD discs), and a 9895A 8 inch disc drive on which to write your recreated software. 1)	Download and unzip the archive file. Recreate each TD0 file onto a 3.5 inch floppy in the normal manner. -	BUOPSXS: Back up of 250 US Operating System, 45274-18001, ver B.04.01. For more information on how to use the HP 260 utilities, visit the 260 page (or read the documentation). If you have a working HP 250, naturally we would like to hear from you. Please contact us. Version B.04 of the operating system is required to run some of the utilities posted in this section. For other uses, you should use (the newer) version B.05 of the operating system.